Master lacquerer (Eric Stocker) explaining the different layers required during application of natural lacquer. 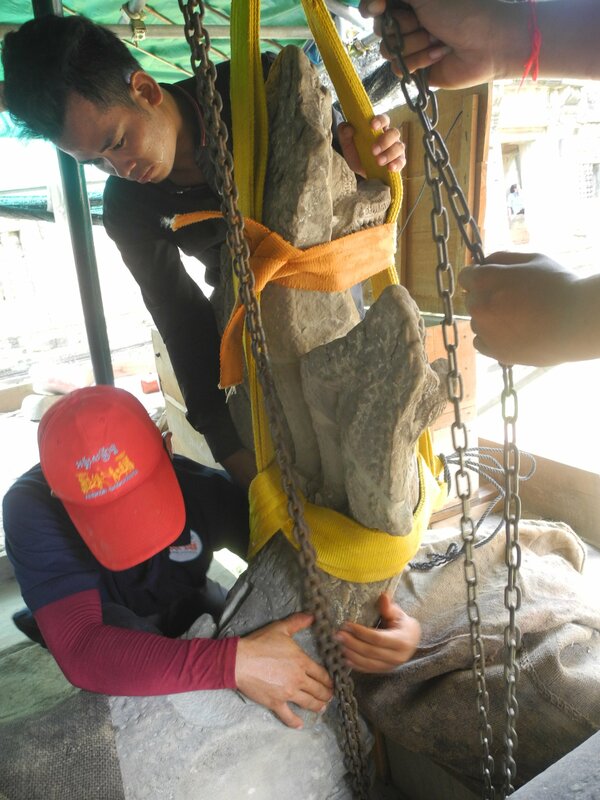 Amongst their continuous conservation and restoration efforts in the Angkor Park, the APSARA Stone Conservation Unit (SCU) is currently working on two prestigious late 12th-century Buddha statues at Prasat Pre Rup (as previously mentioned here). Both statues are, as one would expect, typically covered in various coats and layers of natural lacquer and polychromy, including decorative embellishments and faint traces of gold leaf. In order to successfully carry out any conservation measures to the highest possible standards the topic of historic lacquer conservation needs to be explored further before starting any actual work on this material. One first step to address this topic adequately has been taken recently in form of a one-day training workshop. On July 5th, 2018 thirty professionals in the field of stone conservation and archaeology from the APSARA Authority as well as the Angkor Conservation Office have been introduced to traditional Cambodian lacquer and its application during an interactive workshop session organised in cooperation between the APSARA Authority and GIZ. The workshop featured three distinct forms of engagement, starting with a site visit at Prasat Pre Rup to introduce the subject directly at the Buddha statues themselves which enabled all participants to identify a variety of historic lacquer applications as well as developing a better understanding of the context of its utilisation in the past. This was followed by a lecture in the Angkor Training Centre of the APSARA Authority on the history and traditional harvesting and processing methods as well as the common uses of the material in Southeast Asia in which the consultant provided not only theoretical aspects on the topic but also has been available for an extensive question and answer session to clarify any concerns by the participants. Building upon all the acquired conceptual knowledge during the first two sessions, the workshop concluded with its main session focussing solely on the practical methods of application for the remainder of the day. Here the attendees could develop hands-on skills in treating their individual stone sample pieces with traditional natural lacquer techniques following the strict methodological guidance by the consultant in its layered application. Master lacquerer explaining traditional uses of lacquer during practical training session. Participants and Master Lacquerer during a site visit. We are happy to have been able to engage with Mr Eric Stocker one of the most prominent experts on traditional Cambodian lacquer in the country for this workshop. 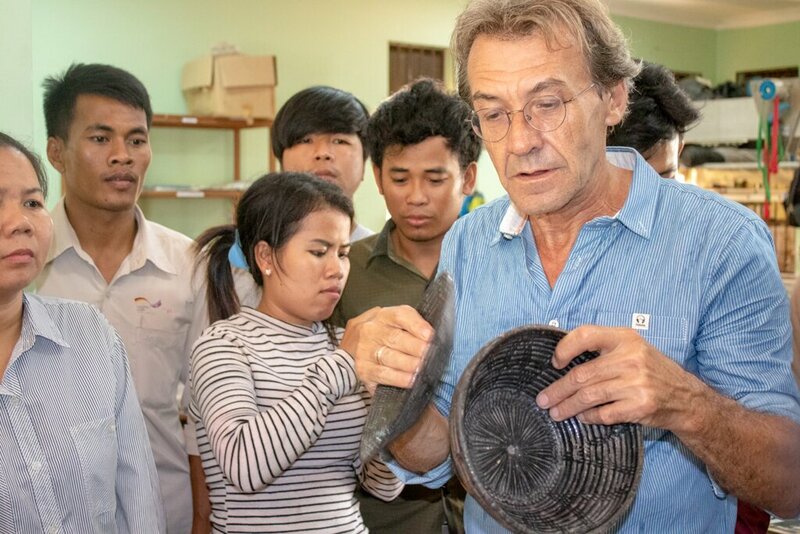 With his background in professional conservation of historic Southeast Asian lacquer work in French museums he came to Cambodia to re-stablish the traditional use of local natural lacquer 20 years ago. 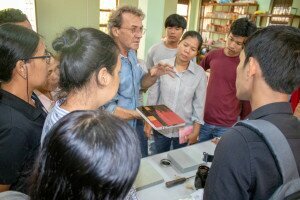 He has since successfully trained numerous locals in these precious skills and continues to do so in his own workshop in Siem Reap to this day. However, both local lacquer trees as well as its traditional utilisation are in steep decline in modern Cambodia and, unfortunately, with it the skills and knowledge surrounding its harvest, processing and application. 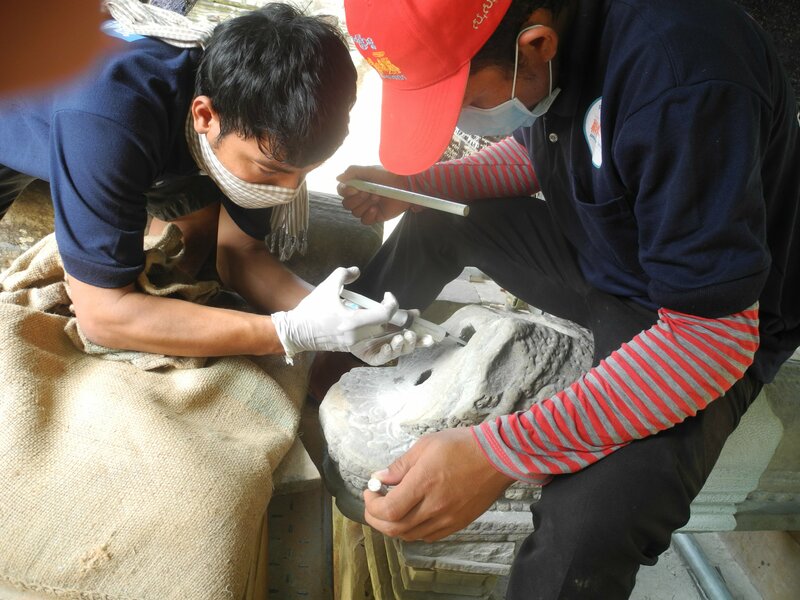 For conserving the precious historic Buddha statues at Prasat Pre Rup, as anywhere in the Kingdom, only to the highest professional standards should be applied. This provides an excellent opportunity to respond to the needs of meaningful capacity building for local professionals so that they are not only enabled to best care for their highly valued tangible heritage objects and monuments but also can contribute to the preservation of intangible heritage like traditional skills and capabilities. Group photo of all participants during a site visit. Regardless of the official completion of the training, the students still keep on learning as they get special further training in the laboratory, with special scientific devices and new materials. So SCU can ensure that the work they carry out in various conservation projects in Angkor meet all the international standards. Siem Reap, Cambodia- The achievements of the young conservators of APSARA Stone Conservation Unit were acknowledged during a graduation ceremony at an internationals conference in Siem Reap. ICC, the International Coordinating Committee for the Safeguarding and Development of the Historic Site of Angkor, is an international forum where experts in various fields can exchange their experiences and views for the preservation and development of the cultural heritage of Angkor. 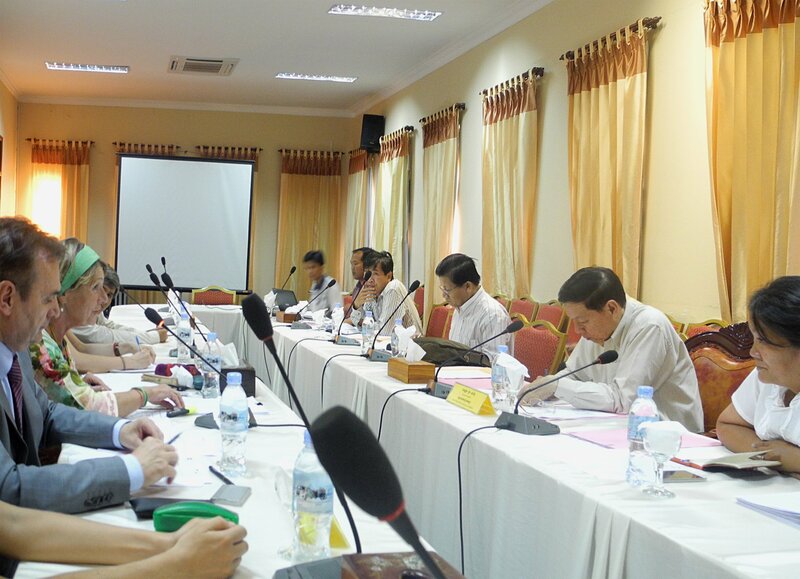 This 2-day- conference is held twice a year by APSARA Authority under the patronage of UNESCO. 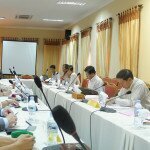 During the 22nd Plenary Session of this conference on 3.12.2015, the Chairman of APSARA Authority H.E. Deputy Prime Minister Dr. Sok An, the Ambassador of the Federal Republic of Germany H.E. Joachim Marschall von Bieberstein, Director General of APSARA H.E. Dr. 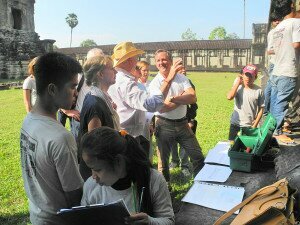 Sum Map and Thomas Bernecker from GIZ Cambodia were handing over the Certificates of Completion to the young conservators of APSARA Stone Conservation Unit. They went through a vocational training in stone conservation for two years. 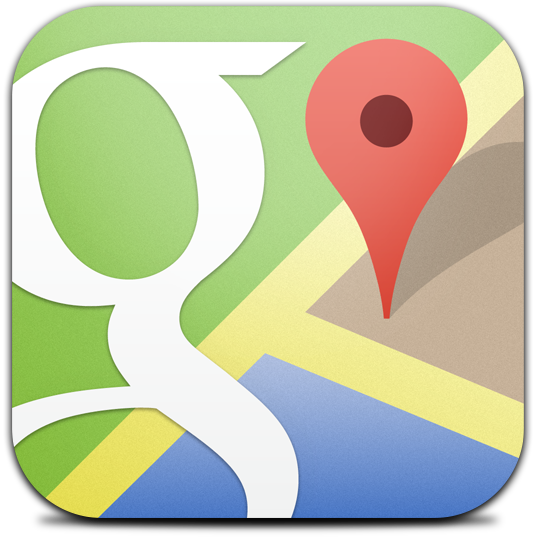 The whole training course is under the patronage of ICCROM. ICCROM is the only institution of its kind with a worldwide mandate to promote the conservation of all types of cultural heritage. It contributes to conservation training by organizing and supporting professional training activities. With the acknowledgement of ICCROM, the Certificates of Completion of the young stone conservators are a valuable asset to their professional careers. Cambodia is a country in the process of recuperation after long and consuming wars. As Cambodia starts to recover, signs of the new beginning can be seen everywhere. In this process the temples of Angkor are playing an important political and spiritual role in the rebirth of self-confidence of the Cambodian people. The Angkor World Heritage Site therefore is of utmost importance for the reconstruction of the Cambodian state and the rejuvenation of the Cambodian people. Since 1995 the German Government has supported projects focused on the conservation of the temples. 1997 saw the beginnings of the German Apsara Conservation Project (GACP) in close cooperation with the Authority for the Protection and Management of Angkor and the Region of Siem Reap (APSARA) under the cultural preservation program. The project is focusing on the conservation of the marvelous carvings and bas-reliefs that can be found in the Angkor Wat area. The project aims at preventing further decay of these awe-inspiring Khmer temples. Since 2007, German Development cooperation is supporting the APSARA Authority with setting up a permanent Stone Conservation Unit (SCU). The Unit carries out conservation treatments in the Angkor Park and offers consultancies to other conservation projects. 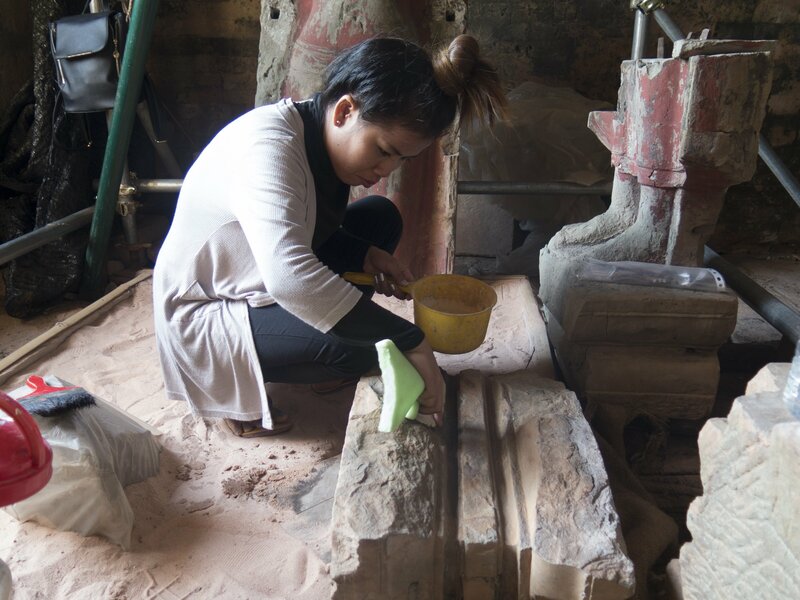 In order to build professional expertise for sustainable stone conservation at UNESCO’s World Heritage site, the APSARA Stone Conservation Unit provides vocational training for Cambodians in conservation and restoration. 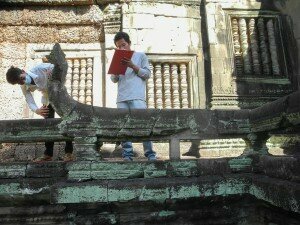 The training is based on a “Handbook for stone conservation in Angkor” that is available in Khmer and English. The timeless smile of the Apsaras is only one of the many miracles that the Temples of Angkor provide for the generations to come. 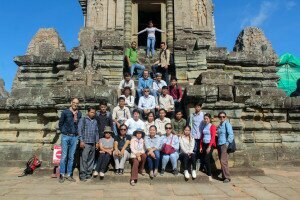 Siem Reap, Cambodia – It was a special day for the 18 students of APSARA Stone Conservation Unit: After two years of intense training they were about to finish their studies with a final exam last Monday. APSARA is the only Cambodian institution offering a vocational training programme to become a Stone Conservator in Cambodia. 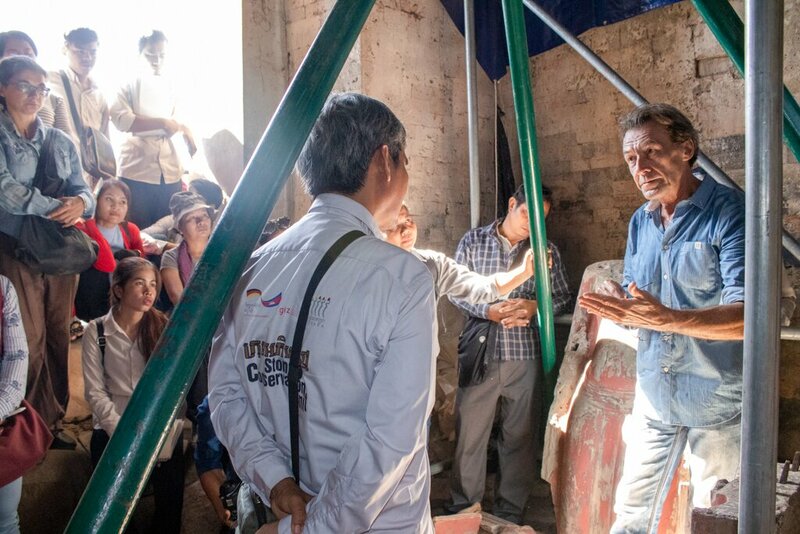 It addresses the urgent need for skilled conservators to safeguard the temples of Angkor and others located in remote areas. 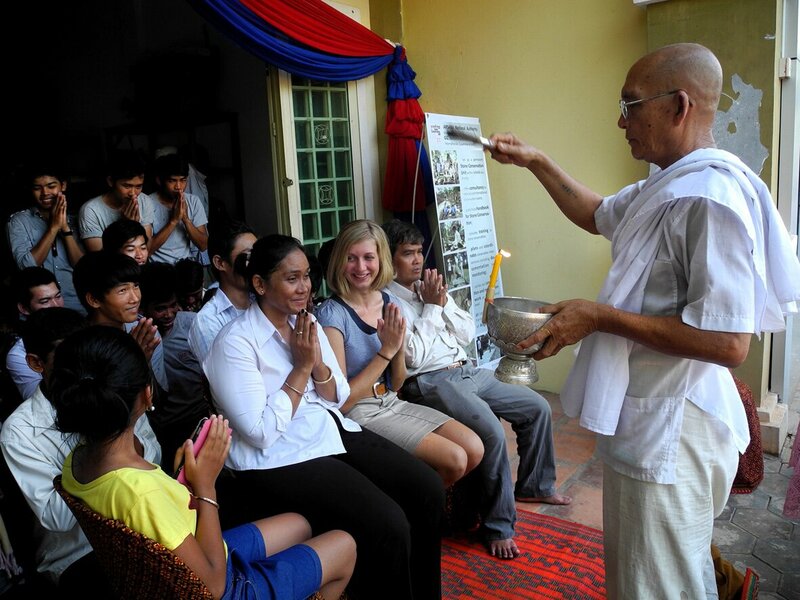 The programme puts the care of Cambodian heritage back into the hands of local people. and guided practical work. 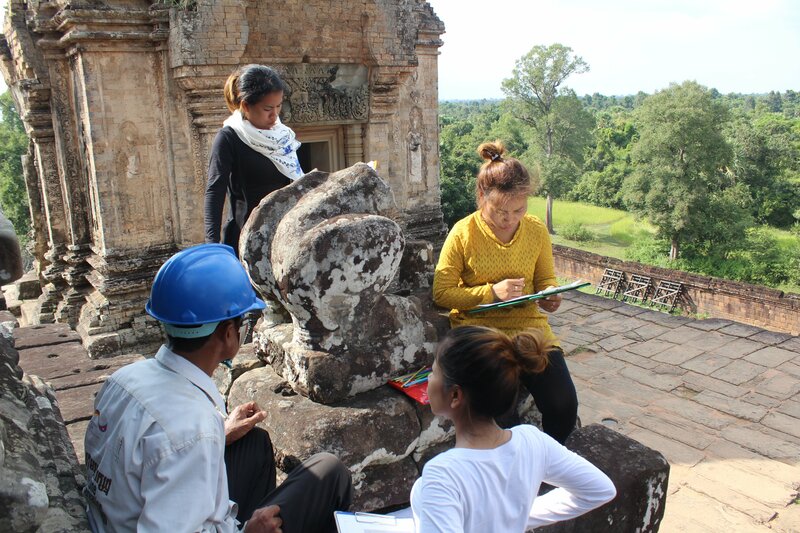 Following the specially developed “Handbook Stone Conservation and Restoration in Angkor”, the students learned how to classify types of natural rocks; their cultural history; how to assess damage on decorated temple walls and how to treat them accordingly. In the last four weeks of their training the students were very busy. Each student composed a condition and damage assessment report on a decorated part of a balustrade at Banteay Samre temple. 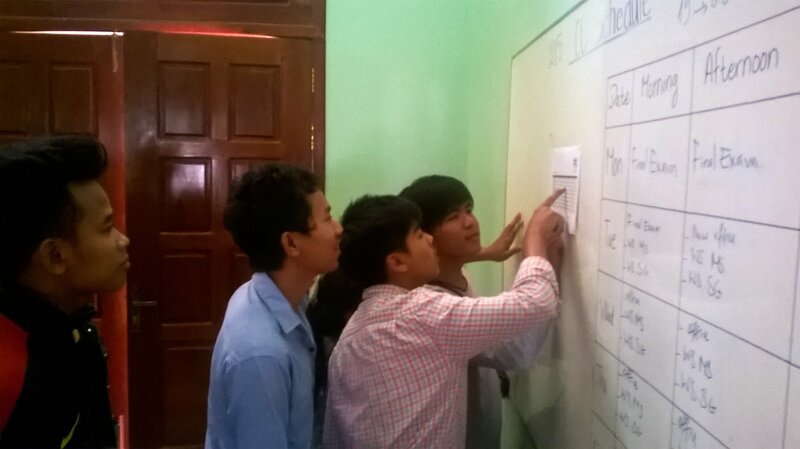 After they handed in their final reports and the mappings, they had to defend their assessment in an oral exam. In a written test their knowledge and theoretical background was verified, while their practical performance was evaluated by the three local training supervisors. All students passed the exam with good results, and so the experts of Stone Conservation Unit are now looking forward to work together with 18 new colleagues. 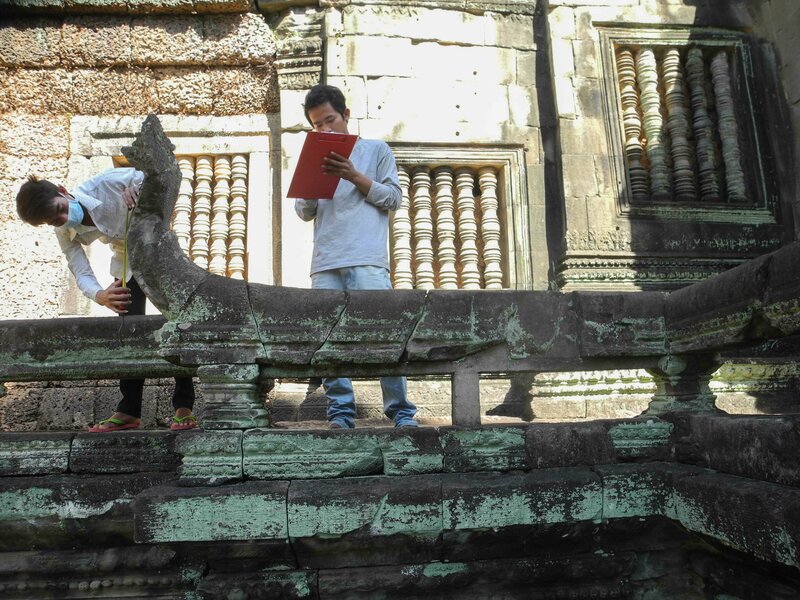 The APSARA Authority announced that all students will be hired and will work either at the temples of Angkor or at other temples throughout the country. After finishing this multidisciplinary training program, 18 young Khmer are now facing a bright future and will contribute to the sustainable preservation of their own cultural heritage. Seminar on Vocational training for stone conservation in Cambodia. SIEM REAP, Cambodia–APSARA National Authority and GIZ recently organized a seminar on vocational training in stone conservation in Cambodia as part of a study to determine the annual demand of trained stone conservation experts inside and outside of Angkor Park and who might be interested in contributing to a long-term vocational training program for stone conservation. Angkor is an outstanding UNESCO World Heritage site and people around the world are increasingly gaining awareness of the importance and its central role in the Khmer civilization. But there are many more ancient sites all over Cambodia that have not received comparable attention, as all temples of Angkor are in critical need of conservation. At present, the government of Cambodia is unable to suitably protect and preserve these sites due to a lack of sufficient financial and human resources. Representatives from the Ministry of Culture and Fine Arts (MOCFA), APSARA National Authority, national and international conservation teams working in Angkor, UNESCO, as well as private companies were invited to visit the facilities of the APSARA Stone Conservation Training Center and to attend the seminar held last month. The director general of APSARA, H.E. Bun Narith and other Excellencies and guests from APSARA, as well as GIZ country director, Mr. Adelbert Eberhardt also attended the meeting. 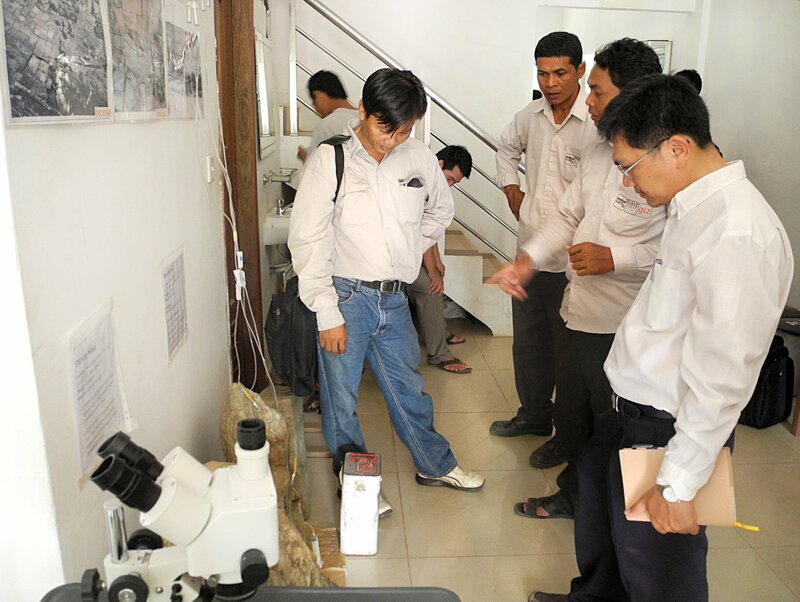 Representatives of the Ministry of Culture, APSARA Authority and international conservation teams visiting the APSARA Stone Conservation Training Center. GIZ advisor Ms. Josephin Rösler and conservation expert Mr. Long Nary presented the study objectives and introduced participants to the APSARA Stone Conservation Training Program. As part of the study, questionnaires were distributed to participants. The information gathered from this study will be used to determine if a long-term vocational training program for stone conservation is feasible for the future. To ensure heritage site conservation is carried out in the best way possible in the future, all stakeholders will need to prioritize investing in vocational training. There will be a role for everyone to contribute to, including the government, international donors, as well as the private sector. Ms. Klemp vistits worksite of the Stone Conservation Unit and meets trainees. 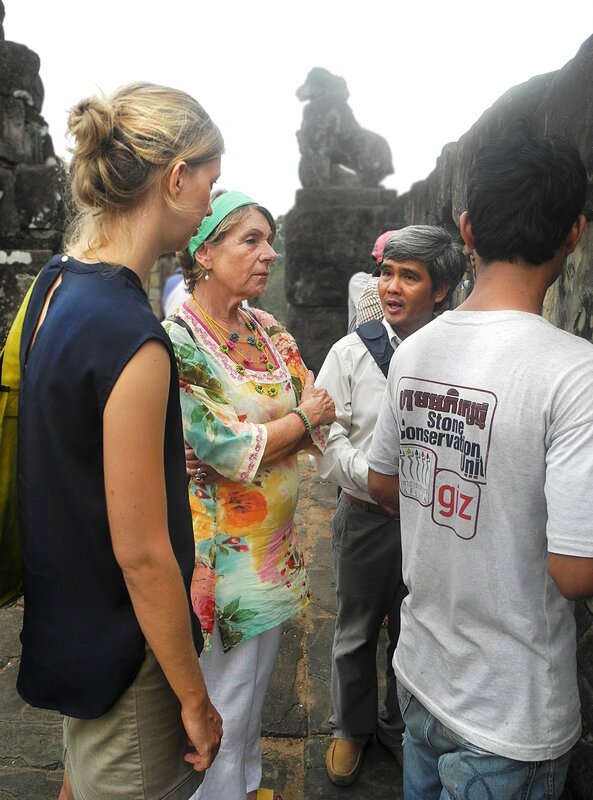 Siem Reap, Cambodia–On April 22, Ms. Ludgera Klemp, counselor of the German Embassy visited the APSARA Stone Conservation Unit (SCU) and the Stone Conservation Training Center in Siem Reap. During the visit, Ms. Klemp met trainees and discussed their motivations and learning experiences with them. Ms. Klemp meets DG of APSARA, H.E. Bun Raith. Embassy and the Ministry of Culture and Fine Arts (MOCFA) are trying to integrate the protection of the cultural heritage sites of Angkor in the National Social Development Plan 2014-2018 process, with APSARA playing an integral part in the preservation of the sites. APSARA committed to initiate the first steps regarding the certification of the stone conservation training. SIEM REAP, Cambodia – H.E. David Lane, US Ambassador to the United Nations Agencies in Rome toured Angkor Park in December 2013. At Angkor Wat, he met the trainees of the Stone Conservation Unit (SCU) who were taking part in a workshop withICCROM (International Centre for the Study of the Preservation and Restoration of Cultural Property) consultant and conservation expert Simon Warrack. During the workshop, students studied chisel marks on an unfinished wall to determine what tools the ancient stone carvers used. “In his way they can understand how their ancestors carved the temple,” Simon Warrack explained. “Later, they will actually carve some sandstone using these traditional techniques.” By understanding how the temples were built, the students improve their ability to preserve them into the future. The US Mission to the United Nations supports the conservation of cultural heritage, such as preservation projects at Angkor Wat and Phnom Bakeng. Siem Reap, Cambodia On 29 March 2013, APSARA’s Stone Conservation Unit held the official opening ceremony for the new Stone Conservation Training Center. The Center will provide a new space for knowledge exchange in the field of conservation and restoration. With the aim to support the increasing demands of qualified conservators in Cambodia, the space includes a classroom, office, a small laboratory and workshop, as well as a library and meeting room. H.E. 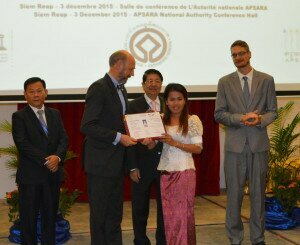 Ros Borath, Deputy Director of APSARA National Authority; German Ambassador, H.E. 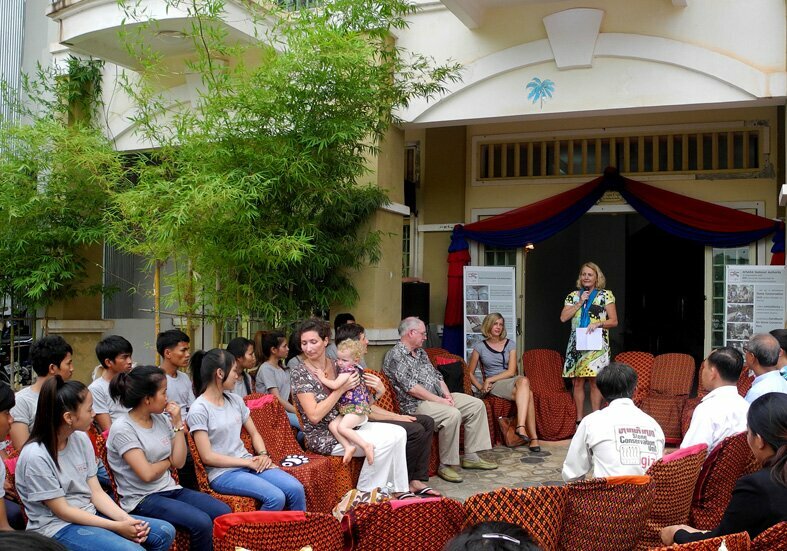 Dr. Wolfgang Moser; GIZ Deputy Country Director Dr. Petra Schill; Madame Mao Loa, Director of the APSARA department DCMA; GIZ Advisor JosephinRösler and the Stone Conservation Unit, as well as a number of guests from APSARA and international conservation teams attended the ceremony. 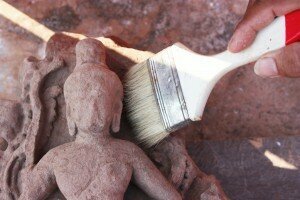 APSARA’s 2-year-stone conservation training was launched in March 2013. Three local stone conservation experts from the Stone Conservation Unit are teaching theory and practice. Other conservation and science professionals with expertise in archaeology, mineralogy, history and microbiology will provide specialized trainings. 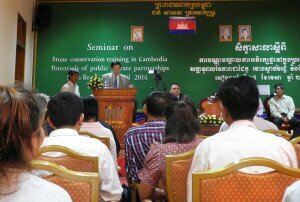 Until recently, it was not possible to study stone conservation in Cambodia. With this new training programme, APSARA is now able to train new conservators on international standards. Siem Reap, Cambodia - The APSARA Stone Conservation Unit (SCU), in cooperation with GIZ, recently launched a new training program for 20 young Cambodians to become stone conservation experts. In February 2013, GIZ handed over necessary training equipment and a new vehicle to the APSARA SCU to ensure safe and reliable access to remote stone conservation field sites. The training program is the only of its kind in Cambodia, and is addressing the urgent need to train stone conservationists from within-in. The program builds local capacities, contributes to the countries’ rich tradition of stone carving and aims to keep conservation in the hands of the people the historical sites belong to In 2012 the project has published a training handbook for stone conservation in English and Khmer languages compiling the practical work and techniques of conservators while working on-site. The lectures for the training and a detailed curriculum have been developed. H.E. Ros Borath, Deputy Director of APSARA National Authority, attended the event and signed the official handover of GIZ training equipment. The program’s new trainees, SCU trainers, GIZ Advisors and the Director of the Department DCMA, Madame Mao Loa, also attended the ceremony. In upcoming months, more information on the progress of this program will be available.